I looked like a hedgehog. For me, the state of my hair is a step function; everything is just fine until EXPLODING SPINY HEDGEPIGS! It's really not. This is probably more a reflection of my tolerance level than the actual process of hairstyle degradation but then, I only got furniture a couple of weeks ago so I think I can be forgiven for having my mind on other matters. There was also the fact that I could see a trip to the salon going horribly and awfully wrong. For a start, I wasn't yet at the stage where I could have a remotely useful conversation about such a topic in Japanese. 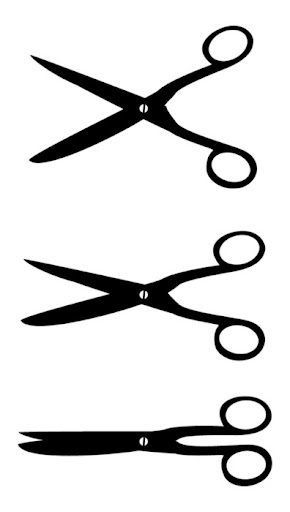 I knew the word for 'cut' and for 'hair' but that much was probably deducible from my presence in the shop. I suspected that, even with a photo, any hairdresser would feel anxious about wielding items with (quickly) irreversible effects without more than optimistic finger snipping motions from their client. Then there was the fact that my hair wasn't typical of the local population. Quite how different Asian and Western hair was for a stylist was a mystery. I wouldn't have thought my hair was particularly tricky; it has a slight wave and a cowslick but it's not a pile of tight ringlets. Still, since I had yet to meet the Japanese pop star of my dreams, I hadn't had the opportunity to run my fingers through other locks to find out. Being as it was the beginning of December, I could have gritted my teeth for another few weeks and just had it cut in the UK. However, this did not really seem like a long-term solution. Instead, I sent a message to a fellow Sapporo blogger who was originally from South Africa. She had an inviting button on her website labelled 'Ask' which was probably designed to instigate insightful questions such as 'What are your views on the Japanese economy?' or 'Is teaching abroad challenging?' or maybe 'Do you miss zebras?'. What she got from me was 'Do you know of an English speaking hairdresser in Sapporo?' Mundane but oh, what an amazingly affirmative answer! I made an appointment the following weekend and a mental note to ask about zebras later. Rie from 'Earth' salon trained in London and had lived there for ten years. She was therefore fluent in English, used to Western hair and knew some aspects of the Japanese hairdressing experience would take me by surprise. Like the fact they cover your face with a towel while they wash your hair. Had she not warned me, I might have taken that rather personally. After the shampoo came a massage. This wasn't just a scalp rub during the wash, but a head, neck and shoulder kneading that lasted about ten minutes. To be honest, I wasn't wearing the best sweater for this; it was a thick white fleece that the girl performing the massage declared was 'fuwa-fuwa', a Japanese onomatopoeia (read: peculiar sound) used for all things furry. "Have you heard of Reiki?" Rie asked me when she returned. "People say it's Japanese, but we've never heard of it! Reiki?" she asked the girl massaging my shoulders. She got a completely blank look in return. "See?" Rie took over and began to cut my hair. "When I first moved to London," she told me. "I was too scared to go to a salon because I didn't speak English at the time. Did you feel the same?" ... was there something about my current hair style that suggested the answer to this might be yes? Rie told me that not only is Asian hair a very different texture from my own Caucasian strands but also the head shape is distinct, being typically flatter at the back. This makes the cut a significantly tailored process. She took a brief note of my photo but then went her own direction, sweeping my hair towards the front. I went slightly cross-eyed as a lock fell between by eyes. She gave it a trim. "Your hair doesn't want to fall in a parting, it wants to go in a swirl." I hoped this wasn't a new bodily commentary about the state of my life. At the end of the cut, I was offered another rinse, but since everything had been beautifully styled I declined. Peaking in the mirror on the way out, I thought the result was slightly Asian.... you know, in a blond haired, blue eyed, pointy nosed sort of way. Maybe it will help with my language skills. Beats talking to a hedgehog in any case. I think I would have had a traumatic meltdown in your shoes. You're so brave! Hair is a very touchy subject even when the salon can speak your language!!! Great post. I have enough trouble finding a hairdresser to do what I want without the barrier of language. The massage was great but next time I'm wearing a lighter sweater so I can feel it more! Sometimes, making the little things easier (like finding a hairdresser who speaks English) really makes all the difference.